HMD Global has plans of charging into 2018 with several new and updated models. The list includes the much-anticipated Nokia 9, budget entries such as Nokia 1 and prospective iterations to the Nokia 8 and 6. 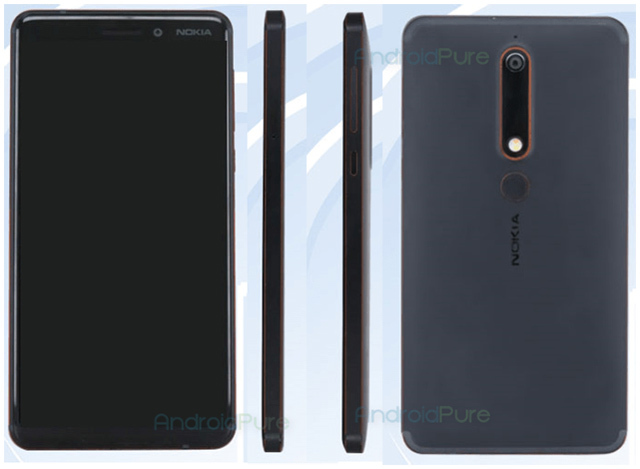 While there is no word about the revised Nokia 8, the 2018 version of the Nokia 6 already leans into the limelight with its specification being revealed, thanks to its certification by the Chinese regulatory body, TENAA. The certification bares all the details about the updated smartphone, revealing that it might be available in two screen configuration. Two different model numbers – TA-1034 (Model 1) and TA-1054 (Model 2) – were certified by TENAA this month. While the former has been confirmed to bear an 18:9 display, the latter will come with a standard 16:9 screen. HMD Global intentions behind this bifurcation is unclear, it could be one of the virtues carried over from Nokia’s DNA, allowing users to choose the best suitable option for their usage. As far as specifications go, Model 1 differs from Model 2 only in terms of the screen ratio. While Model 1 is rumored to carry a 6-inch Full HD+ display of unknown technology, Model 2 has been confirmed to use a 5.5-inch Full HD LCD display. Model 2 is also apparently smaller in size compared to the last year’s Nokia 6 in order to bump up the screen-to-body ratio by nearly 2.5%. Another noticeable change is that the fingerprint has been relocated to the back of the smartphone. Under the hood, both models are expected to be identical and are likely to run on an undisclosed octa-core Qualcomm Snapdragon processor, which could be the new Snapdragon 670 or 640. The smartphone will be capable of effortlessly breezing through multiple apps due to 4GB of RAM. Further, it will house a 3,000mAh battery. In terms of photography, Nokia seems to be unmoved by the wave of dual cameras as both the model will carry single cameras on both back and front. The rear and selfie cameras are rated at 16MP and 8MP respectively. Despite the availability of Android Oreo beta for this year’s Nokia 6, the certified models were tested with Android 7.1.1. And while Model 2 will be available in White, Black and Blue colors, we can expect a different coloring scheme for the 18:9 variant. Moreover, there is no official word on the launch date but earlier rumours hint at an unveiling early in January and most likely during the CES 2018.